Blurb: After her father’s death, Ruth Robb and her family transplant themselves in the summer of 1958 from New York City to Atlanta—the land of debutantes, sweet tea, and the Ku Klux Klan. In her new hometown, Ruth quickly figures out she can be Jewish or she can be popular, but she can’t be both. Eager to fit in with the blond girls in the “pastel posse,” Ruth decides to hide her religion. Before she knows it, she is falling for the handsome and charming Davis and sipping Cokes with him and his friends at the all-white, all-Christian Club. We readers so often approach novels set in the past and believe that the struggles depicted within their pages couldn’t be relatable to us currently. 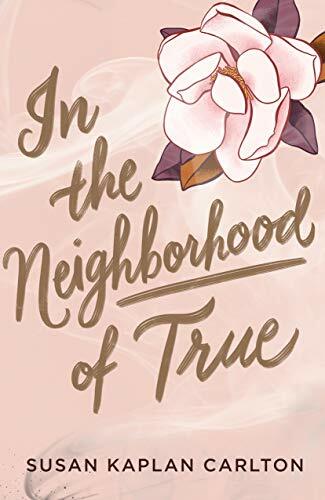 As I read Susan Kaplan Carlton’s In the Neighborhood of True, I thought of how little we had actually changed, especially in light of blatant events in the past few years. Ruth has just lost her beloved father to a heart attack five months earlier and now she, her mother, and younger sister have moved in with her grandparents in Atlanta. Ruth is immediately swept up in the fashionable world of pre-debutantes and aspires to wear a crown like her grandmother and mother did before her. However, if anyone ever discovers that she is Jewish, she’d have little chance of attaining that crown. The conflicts Ruth feels are understandable, especially as she has her eyes opened to the violence and oppression of the Jim Crow south but still wants to enjoy the seeming beauty and culture of Atlanta’s affluent. While she calls herself “shallow” frequently, Ruth simply strikes me as a young woman who is on the road to discovery and one of the biggest discoveries is who she is. Even Ruth’s relationships are telling. She falls in love with the handsome boy with the dimple, Davis, who’s a stargazer and wants to be someone who travels in space, perhaps to ignore all of the ugliness around him, but she can only really be herself with Max, a Jewish college student, who is smart, brash, wears Buddy Holly glasses and frequently annoys her although he is fighting the fight for social justice. While the pacing of most of the novel was on target, I felt the end was too speedy with everything too nicely sorted especially when the opportunity was ripe for conflict, belief challenges, and the messiness that comes from clashing cultures. However, Ruth does find herself, and the reader suspects that Ruth’s future will entail some messiness. I received an ARC from Algonquin Young Readers in exchange for an honest review. I thought of Davis and his single dimple and how his hand had hovered at the small of my back, making me feel its phantom weight even when he wasn’t touching me. I thought of a different day and a different dress, this one with sunburst pleats-how he’d unzipped it and fanned it out on the grass that night at the club, how the air was sweet as taffy, and how when we rejoined his family I’d wondered if every pleat was back in place. It was cool at the back of the closet-in what I’d come to think of as my New York section, the land of navies and blacks and grays-where the floor was concrete, smooth and solid beneath me. When we’d first arrived here at the end of an airless sum mer, Mother, who’d changed from Mom to Mother when we crossed the Mason-Dixon Line, told her parents, whom we’d always called Fontaine and Mr. Hank, that Nattie and I needed wall-to-wall carpet to cushion our landing. Maybe we needed cushioning after the shock of our father’s death, or maybe we needed cushioning after moving from our apart ment in New York to our grandparents’ guesthouse behind the dogwoods. Either way, the next afternoon, two men turned up with a roll of white carpet and stapled it over every square inch of the place, save for the closets. How did you write TRUE? All at once or did you outline the story? What was the most surprising thing you learned in creating your characters? Which of your characters do you most identify with, and why? What gave you the idea for TRUE? Do you have a favourite scene, quote, or moment from TRUE? What is on your current TBR pile? Do you write to music? If so, what artist were you listening to while writing TRUE?